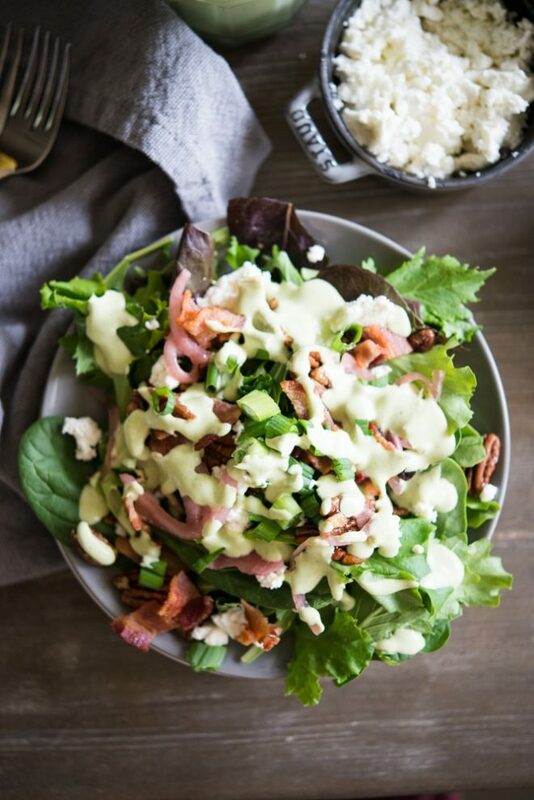 A delicious, dinner party or DIY wedding-friendly salad, this recipe is sure to knock your guests' socks off. 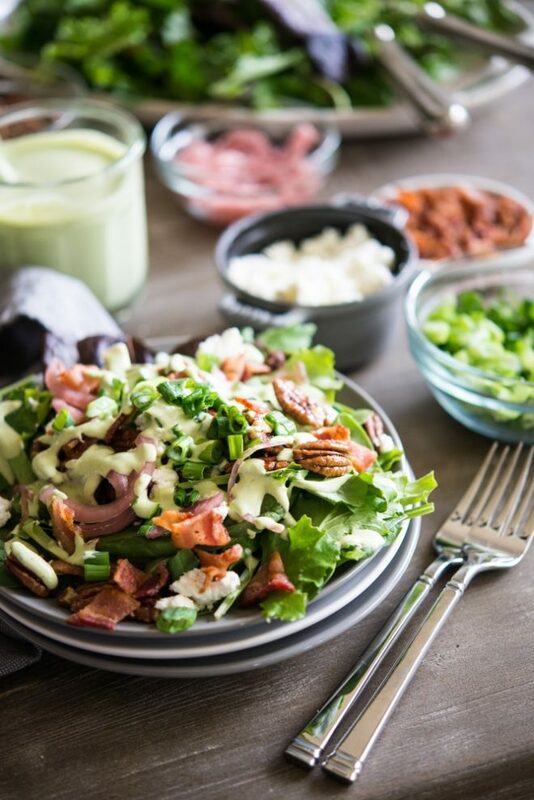 Complete with mixed greens, crisp bacon, goat cheese, fresh green onions, candied pecans, pickled purple onions, and two options for dressings (a creamy pesto ranch and a lemon vinaigrette), this “wedding salad” is the one I designed and served at my own wedding. It's a real crowd pleaser and worth keeping on hand! I don’t often play favorites with my recipes, but this one occupies a special place in my heart. You see, I started planning this recipe exactly 1 year and 3 months ago. 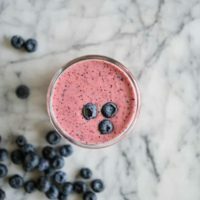 I was dreaming up a health-conscious salad that would please a wide variety of tastes, look especially beautiful on a plate, and would be easy to prepare in large batches. I drafted a few varieties, but this final version won my heart. Essentially constructed as a “build your own salad,” this mix of my favorite ingredients is the exact salad we served at our semi DIY wedding on October 24, 2015. Before I get carried away with too many wedding details in this post, I have to tell you that I have FINALLY decided to share our full wedding story with you all! I’ll share our photos, video, and menu recap in the next couple days in a dedicated blog post. It was a dreamy, unique, fabulous affair and it’s high time I share some of the details. 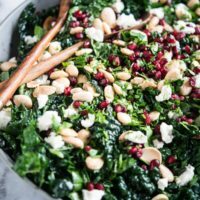 I chose to hold off on publishing THIS salad recipe and our wedding recap for our 1-year anniversary …which my husband and I will celebrate on Monday, October 24th. The food spread at our wedding was a mixture of homemade (by yours truly) and gourmet food truck. Our food trucks included an Asian fusion truck and a BBQ truck (who served beef brisket provided by Franklin’s BBQ out of Austin, TX – YUM). Though our fabulous food truck friends tended to the main courses, I wanted to plan and prepare a cocktail (my spicy margarita), salad, and an edible wedding favor (I’ll get to that piece in my next wedding post). Serve everything in separate bowls – don’t pre-mix. This helps to extend the life of the salad! It also makes for simple storing and for a beautiful display. 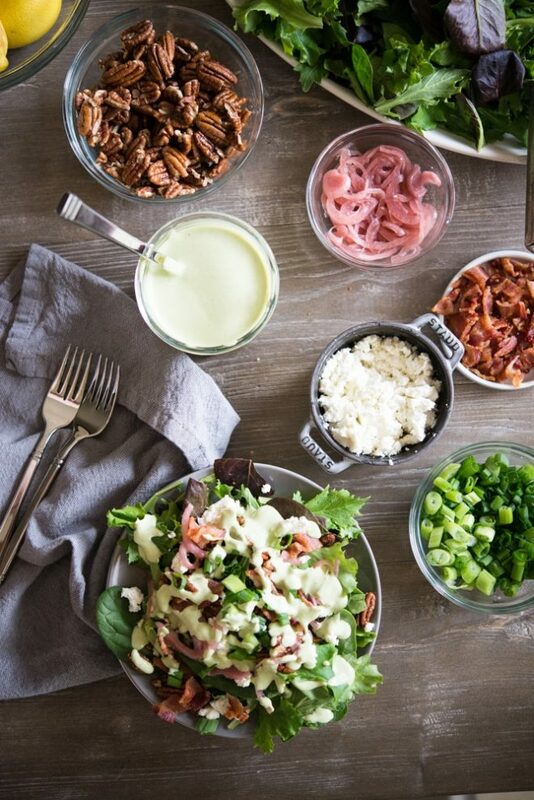 Have several options for toppings and dressings to help cater to all tastes and dietary requirements. 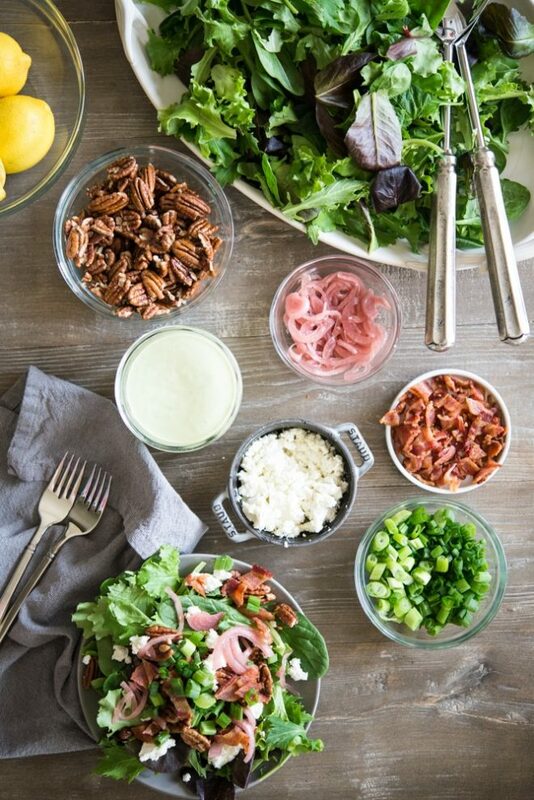 Design salad components that can be easily prepared in advance. Plan to serve flavors that YOU and your future hubby (swoon) love. Enlist help from the people saying they want to help. A spring mix base (easy to buy in bulk). Chopped bacon (make this in advance and freeze). Crumbled goat cheese (delegate this to a friend or family member!). Pickled purple onion (easy to make in advance as it keeps well). Chopped green onion (do this the day before or ask a friend to help!). Candied pecans (make these in advance and freeze). Dressing A: creamy pesto ranch (make week-of and/or ask a friend to help). 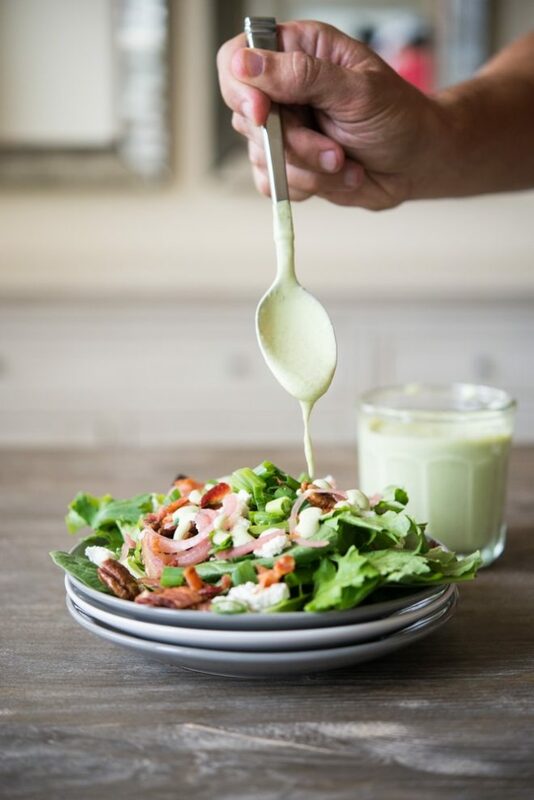 Dressing B: lemon vinaigrette (make week-of and/or ask a friend to help). Because we hosted our wedding at a private residence and didn’t have a catering crew built-in, we provided all our own plates and utensils. THESE are the “plates” and THESE are the utensils I ordered for the salad, food truck menu offerings, and cakes. The salad was a hit and it gave me warm-fuzzy feelings to know that folks were enjoying something homemade. 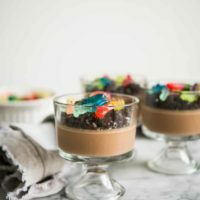 If you’re in the middle of planning a wedding, whether it’s totally DIY or just slightly DIY, I hope this recipe comes in handy! If you’re NOT in the middle of planning a wedding, I hope you still enjoy this recipe. 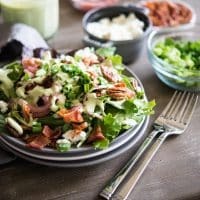 It’s one of the most satisfying salads I’ve ever enjoyed and I love making it anytime we have a dinner party. For the candied pecans: toss the pecans in the honey and then spread them out onto a parchment paper-lined baking sheet. Sprinkle with the sea salt and then bake at 375 F for 5 to 7 minutes, or until they just begin to darken in color, but not burn. For the Cream Pesto Ranch: blend the basil and the lemon juice together until smooth, then stir the basil into the mayo until it’s well-incorporated. Either store in the refrigerator or serve. For the Lemon Vinaigrette: whisk the ingredients together and either store in the refrigerator or serve. To plate: either plate each component separately or mix them all together. 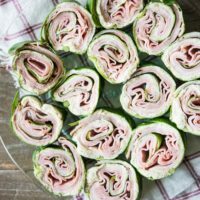 Serve with one or both dressings on the side and enjoy! Do you have the recipe for that lemon vinaigrette anywhere on your blog? It looks amazing. Hmm, is the recipe supposed to be here? I’m in the middle of planning my semi DIY wedding, and can’t wait to see your wedding post! !